Born: October 15, 70 B.C.E. Died: September 21, 19 B.C.E. Virgil was born on October 15, 70 B.C.E. , at Andes near Mantua in Cisalpine Gaul (modern Mantova, 20 to 25 miles southwest of Verona, Italy) of humble parentage. His father, either a potter or a laborer, worked for a certain Magius, who, attracted by the intelligence and industry of his employee, allowed him to marry his daughter, Magia. Because the marriage improved his position, Virgil's father was able to give his son the education reserved for children of higher status. Virgil began his study in Cremona, continued it in Milan, and then went on to Rome to study rhetoric (the study of writing), medicine, and mathematics before giving himself to philosophy (the study of knowledge) under Siro the Epicurean. His education prepared him for the profession of law (the alternative was a military career), but he spoke only once in court. He was shy, retiring, and of halting speech—no match for the aggressive, well-spoken lawyers of the Roman court. Virgil returned from Rome to his family's farm near Mantua to spend his days in study and writing and to be near his parents. His father was blind and possibly dying. His mother had lost two other sons, one in infancy, the other at the age of seventeen. When Virgil's father died, she remarried and bore another son, Valerius Proculus, to whom Virgil left half his fortune. In appearance Virgil was tall and dark, his face reflecting the rural lower-class stock from which he came. His health was never strong. Horace (65–8 B.C.E. ) tells us that on a journey to Brundisium in 37 B.C.E. , he and Virgil were unable to join their fellow travelers in their games for he had sore eyes and Virgil was suffering from indigestion. Poor health and his shy nature and love of study made him a recluse, or one who withdraws from the world. The farm of Virgil's father was among the land confiscated (forcefully taken) as payment for the victorious soldiers of the Battle of Philippi (42 B.C.E. ). But Augustus (63 B.C.E. –14 C. E.) restored the farm to the family. Virgil then rendered thanks to young Caesar in his first Eclogue. The final phrase of the epitaph (etching on a tombstone) on Virgil's supposed tomb at Naples runs "cecini pascua, rura, duces (I sang of pastures, of sown fields, and of leaders)." This summarizes the progression from Eclogues to Georgics to Aeneid (which appeared in that order) and, as has been said, "proposes a miniature of the evolution of civilization from shepherds to farmers to warriors." Bucolics, or "Pastorals") were written between 42 B.C.E. and 37 B.C.E. These ten poems, songs of shepherds, all about one hundred lines long, were modeled on the pastoral poems, or Idylls, of Theocritus of Syracuse (c. 310–250 B.C.E. ). Eclogue 4, the so-called Messianic Eclogue, is the best known. Written in 40 B.C.E. , during the temporary rule of Pollio (76 B.C.E. –4 C. E.), Virgil's benefactor (one who gives financial aid) a year or two previously, it hails the birth of a baby boy who will usher in a golden age of peace and prosperity in which even nature herself will participate. The golden age is the new era of peace for which Augustus was responsible, and the child is thought to be the expected offspring of Augustus and Scribonia (the infant turned out to be a girl). The Georgics ("Points of Farming"), a didactic (intended to instruct) poem in four books, was written from 37 B.C.E. to 30 B.C.E. Book 1 treats the farming of land; Book 2 is about growing trees, especially the vine and the olive; Book 3 concerns cattle raising; and Book 4, beekeeping. The Aeneid is one of the most complex and subtle works ever written. An epic poem of about ten thousand lines and divided into twelve books, it tells of the efforts of the Trojan hero, Aeneas, to find a new homeland for himself and his small band of followers, from the time he escapes from burning Troy until he founds Lavinium (in Italy), the parent town of Rome. Shortly after Actium, the final battle of the Roman civil war 31 B.C.E. , Augustus, the victor, was looking for a poet who could give to his accomplishments their proper literary enhancement in an epic poem. Maecenas (c. 70–8 B.C.E. ) offered the commission to Propertius and to Horace, both of whom declined as graciously as possible. Virgil had been less reluctant than the other two and found, through his imagination, a solution. His epic of Augustan Rome would be cast in mythological form, making use of the legend of the founding of Rome by Aeneas, a Trojan hero mentioned by Homer (ninth or eighth century B.C.E. ), who, tradition held, escaped from Troy and went to Italy. Virgil's models were the Iliad and the Odyssey of Homer. The Aeneid can be divided into two parts of six books each or into three parts of four books each. Books 1 through 4, organized around Aeneas's narration of the destruction of Troy and his wanderings, have Carthage as their dramatic setting; Books 5 through 8 act as entertainment between the drama of 1 through 4 and 9 through 12, the story of the fighting in Italy. Moreover, the even-numbered books are highly dramatic, while the odd-numbered books reflect a lessening of tension and have less dramatic value. 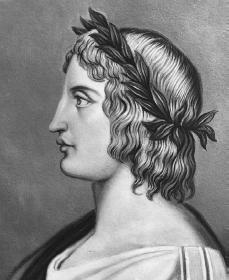 Virgil worked on the Aeneid for the last eleven years of his life. The composition of it, from a prose (writing) outline, was never easy for him. Augustus once wrote asking to see part of the uncompleted work. Virgil replied that he had nothing to send and added, "I have undertaken a task so difficult that I think I must have been mentally ill to have begun it." In 19 B.C.E. Virgil resolved to spend three more years on his epic after taking a trip to Greece, perhaps to check on some details necessary for his revision. At Megara he contracted a fever and became so ill that he returned to Brundisium, where he died on September 21. He left instructions that the Aeneid should be burned, but Augustus refused and ordered Various and Tucca, two friends of the poet, to edit it for publication. It appeared in 17 B.C.E. Gale, Monica. Virgil on the Nature of Things. New York: Cambridge University Press, 2000. Levi, Peter. Virgil: His Life and Times. New York: St. Martin's Press, 1999. Wright, David H. The Roman Vergil and the Origins of Medieval Book Design. London: British Library, 2001.
who were in virgil family and names would be help full also did virgil have a profesion other than poetry.